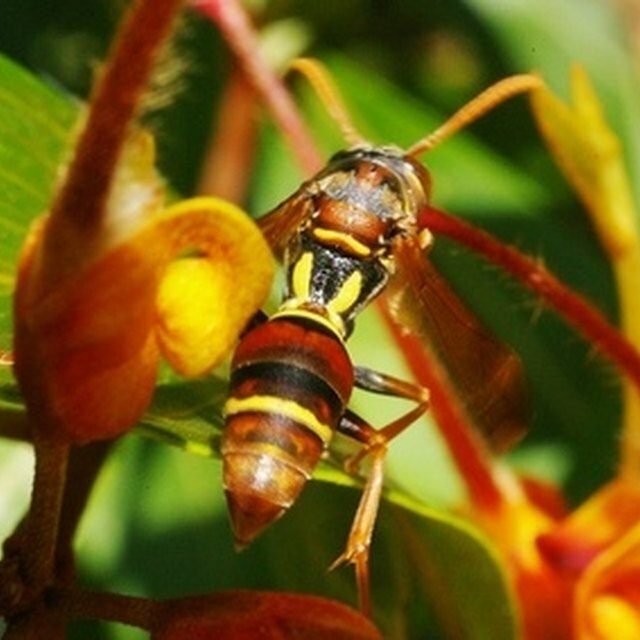 Wasps are beneficial insects, but they can be dangerous. Many species deliver a painful sting and have a habit of mobbing their victims. Paper wasps and yellow jackets typically nest under the eaves of houses, as they prefer undisturbed locations. Wasps can become a serious problem during autumn, when families are spending time outdoors. Home owners can eradicate wasp nests without assistance from pest control professionals, but they need to exercise caution to prevent personal injury. Wasps can be quite dangerous to humans who venture too close to their nest. Eradicate wasps during June if possible. At this time of year, the queen has already established her colony, but it's usually still small. Wait until dark, as wasps are less active then. Wasps also don't fly well when temperatures drop to below 50 degrees Fahrenheit. Ask an assistant to help you by turning on an outside light, so you can see the nest. Place a ladder against the house and climb up half-way. Have the assistant stand below the ladder to hand you the aerosol wasp-and-hornet spray. Wait to see if any wasps appear at the entrance to their nest. If not, reach up and direct the nozzle of the aerosol can into the entrance. Spray numerous times, following the directions for the specific brand of aerosol spray you're using. Leave the area immediately, for your safety and the safety of your assistant. Observe the nest throughout the following day. If you don't see any wasps arriving or leaving the nest, you have been successful in destroying the insects. Wait until after dark, as an extra safety precaution, and remove the nest. Wrap the nest in a plastic bag and discard it in the garbage. Repeat the steps at three-day intervals, until you have successfully destroyed the insects, if you weren't able to do so with the initial aerosol application. Remove the nest mechanically, if it's very small and if you choose not to use an aerosol spray. Wait until dark and use a ladder to access the nest. Ask an assistant to stand below the ladder. Quickly place a heavy plastic bag over the entire nest. Use a thick stick to knock the nest free and into the bottom of the bag. Hold the neck of the bag closed and pass the bag to your assistant. After you've climbed down the ladder, seal the neck of the bag with a plastic cable tie. Place the bag into a freezer and discard it in the garbage the following day. Wait until fall if you haven't been successful in removing the wasps before then. The cold temperatures will invariably kill the colony, and at that point you can safely remove the nest. Removing a nest full of living wasps poses a greater risk than spraying the nest and should only be attempted on small nests that can easily be knocked free from under the eaves.